While nearly all enterprises build information systems, the end objective is not just an information system, but a flexible, changeable, and reusable asset that will meet current and future business needs. Few organizations today use model driven approaches that truly separates Architecture (Engineering) from Implementation (Manufacturing). Throughout recorded history, as complexity increases, separating Architecture from Implementation becomes an imperative. These experiences can now be provided through our course of study. As human beings, we are naturally “visually” oriented. We cannot “see” the essence of a problem or solution in one thousand pages of text. As importantly, one representation that suits both business personnel, and technology personnel is not possible in disciplines outside of Enterprise Architecture, so it is probable that the same difficulty of looking for “one representation” for Enterprise Architecture will occur. The EACOE and its body of knowledge, through actual Enterprise Architecture training, practitioning, courses, workshops, consulting, and practitioner professionalization activities, provides the only holistic and comprehensive environment for the Enterprise Architect. This environment allows the Enterprise Architect to follow an experience-driven disciplined architecture process, using models to help enterprise stakeholders envision, plan, and develop cohesive, flexible, and adaptive solutions that deliver high-value, and become enduring Enterprise assets. 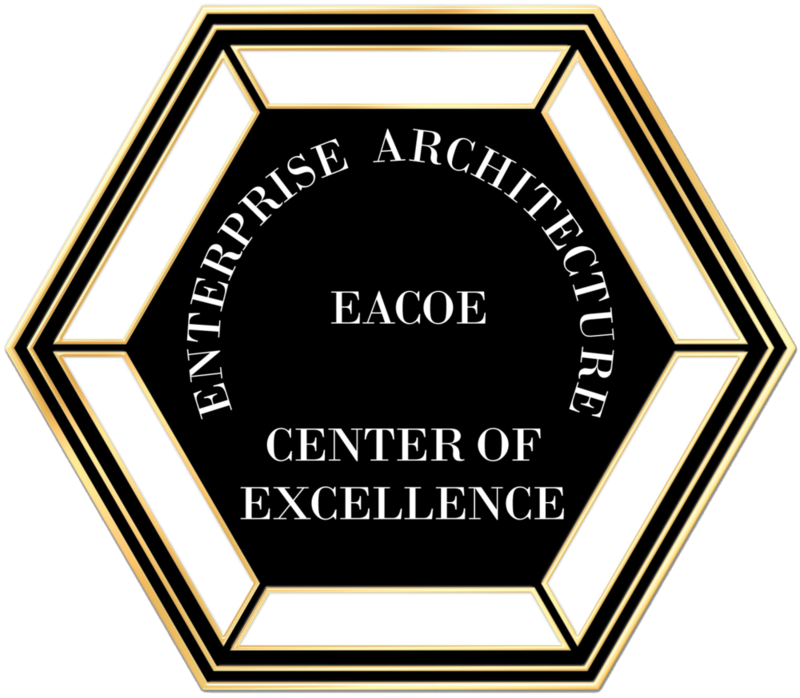 The Architectures Center of Excellence & EACOE, are the leading practitioner-based associations for the Enterprise Architecture professions. We set professional standards, conduct research, provide information, and promote professional and career development. We offer practice-based certification, professional networking, and knowledge development opportunities. Our Organization Benefits the Enterprise and the Practitioner. In this era of Enterprise change, the need to link sound corporate strategy and information strategy has never been greater. Technical strategies alone are not capable of ensuring alignment and providing business value. To benefit from the information resources that are key to your organization growth, it is essential to have an Enterprise Architecture aligned with your Business Strategy, that aligns with your Business Goals, and is capable of effectively addressing and managing risk. Our Certified Enterprise Architecture professionals can help ensure your enterprise’s success. Organizations employing or contracting EACOE Certified Enterprise Architects understand the need for professionals who have credentials that are known and respected around the world. Our Certified Enterprise Architects have the proven ability to perform Enterprise Architecture activities with globally accepted standards and guidelines to ensure that the enterprise’s information technology and business systems are aligned with Business Goals, are capable of change in continually changing business and technology climates, can reuse enterprise systems assets, and are cost effective. Enterprises are in search of practitioners that are up to date with current proven practical practices and are committed to their profession. EACOE Enterprise Architect Certification are these practitioners, and these professionals maintain skills that are an imperative in today’s competitive environment. EACOE Certified Enterprise Architects have committed to maintaining skills, following a professional path that continually allows for skills enhancement and demonstration, knowledge gain, professional development, and are distinguished from other Enterprise Architects. Our Enterprise Architects with advanced certifications have demonstrated Enterprise skills, attended a rigorous education and training course, continue to demonstrate skills by periodic recertification, and have a desire to be leaders in their profession.